Scotch single malt whisky brand Ardbeg has officially appointed The Grande Whisky Collection as Southeast Asia’s first Ardbeg Embassy. You know how there are those bars or pubs that fly a certain soccer team’s colours, and regularly host events for its rabid fans? Well, Ardbeg‘s first Ardbeg Embassy started that way back in 2009 – just two years after it was acquired from Allied Lyons by The Glenmorangie Company – and as the network of ardent bars and retail outlets grew they began to host the Ardbeg Committee, Ardbeg’s official fan club that boasts a worldwide membership of over 130,000 lovers of Islay’s peatiest whisky. The number of embassies today number around 130; well, add one to the number now that Singapore – and Southeast Asia in general – has gotten its first Ardbeg Embassy with The Grande Whisky Collection in ION Orchard pledging its support for “all things Ardbeggian”. Sweden, Japan, and Taiwan are home to the largest number of Ardbeg Embassies. Ardbeg’s global brand ambassador Hamish Torrie was in Singapore recently to welcome (the yet-to-be-publicly-launched) The Grande Whisky Collection to the distinguished family. 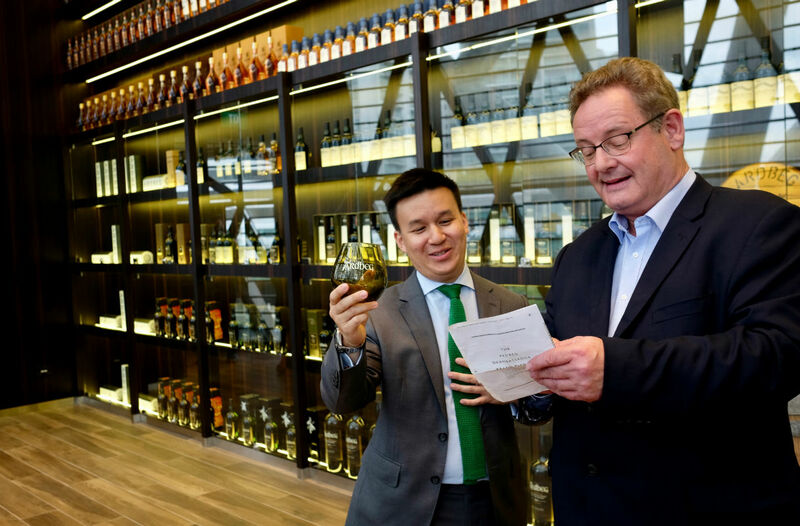 “The decision to award The Grande Whisky Collection as Singapore’s first Ardbeg Embassy was an easy one,” said Torrie (pictured below, right). And no wonder; The Whisky Trust-owned The Grande Whisky Collection – slated to open to the public in mid-June – holds one of the largest collections of fine and rare whiskies in Asia with some 2,500 Japanese and Scottish whiskies, much which are highly sought-after expressions acquired from auctions. Now it will also serve as a “spiritual outpost” for Ardbeg where Arbeg enthusiasts can gather, share drams and get access to exclusive limited-edition releases, like those specially bottled for Ardbeg Committee members such as Supernova, Rollercoaster, Alligator and the recently announced Grooves.